This past week, Syfy released the trailer for their upcoming series, The Expanse… and I’m super excited! For one thing, it’s great that Syfy is actually making an effort to have legitimate science-fiction shows again. After rebranding in hopes to pull in a broader audience, the channel seems to be returning to its roots. While Ascension came and went to mediocre reviews, I have heard nothing but good things about the 12 Monkeys pilot that aired a few days ago. Conceivably, this could indicate that Syfy is better at making adaptations of pre-existing source material than original stories, which bodes well for the upcoming shows based on James S.A. Corey’s The Expanse series, Lev Grossman’s The Magicians trilogy, and Arthur C. Clarke’s Childhood’s End. I’m excited, in particular, for The Expanse adaptation, as I recently read the first book in James S.A. Corey’s series — Leviathan Wakes. Let me say right off the bat that I really liked this book. It’s somewhat of a lighter summertime read (I’ve heard it referred to as the book version of a blockbuster popcorn flick, which is a perfect descriptor), but that’s not to say that it is stupid or banal. In fact, I found Leviathan Wakes to be quite a compelling, hard-to-put-down page-turner. 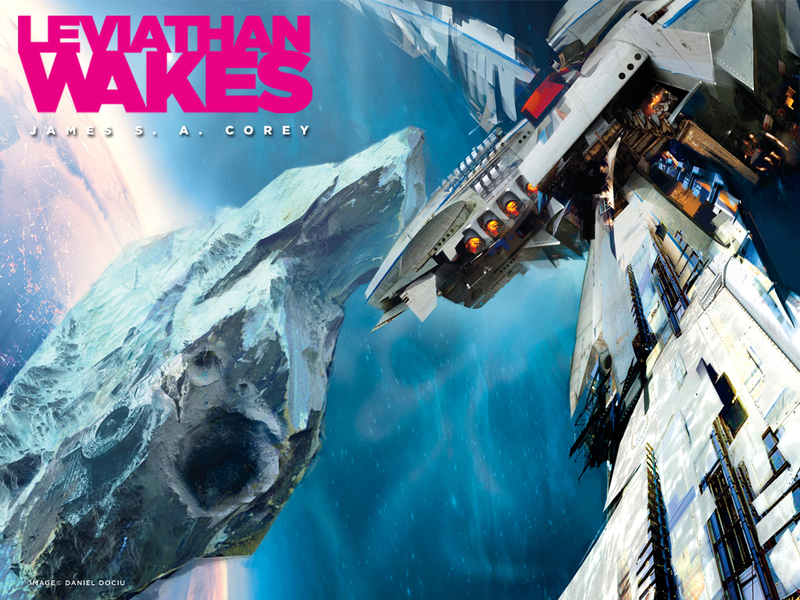 The Expanse series is a space opera, but unlike many stories of that genre, Leviathan Wakes is not an intergalactic tale about space exploration. Rather, it takes place in the period just before that, when humans live on Earth, Mars, and certain minor planets this side of the asteroid belt. I think my favorite part of this book was the worldbuilding. In particular, I was thoroughly intrigued by the politics and tension between the Earth-Mars Coalition and the inhabitants of “the Belt.” Corey (the nom de plume of co-authors Daniel Abraham and Ty Franck) does a fantastic job of exploring the prejudices between these two cultures by giving the two main protagonists ties to both. Holden is an Earth-born man now working as an ice miner in the Belt; Miller is a Belter detective working for an Earth-owned security corporation on Ceres. This allows for a somewhat fluid dual-allegiance and inner conflict as the characters navigate a solar system filled with hate and oppression. The novel is structured in alternating POV chapters between Holden and Miller. Detective Miller’s plotline follows his investigation into the whereabouts of a wealthy, young runaway named Julie Mao. His is a hard-boiled crime narrative that delves deep into the seedy parts of Ceres station, as well as into Miller’s own mind as he obsesses over finding the missing girl. Holden’s story is more standard science fiction. It begins when he and his co-crew members encounter a distress signal, and their ship is subsequently attacked by mysterious stealth ships. In his efforts to provide truth and transparency about the situation, Holden ultimately adds fuel to the fire of social unrest, and Mars declares war on the Belt. Over the course of Leviathan Wakes, Holden’s and Miller’s stories intertwine as they uncover a strange conspiracy, all the while working to put an end to the imminent war. Now, as I mentioned earlier, I really liked this book. There was, however, one thing that kind of bugged me — and it has to do with the story’s central climax. So, there will be mild spoilers below the next image. If you choose to stop here, please know that I nevertheless still recommend you read Leviathan Wakes. For those of you who wish to proceed with the spoilers, tally ho! This is weird and hard to explain. My biggest complaint about the book was the “vomit zombies.” In the central climax of the story, people become infected by a mysterious substance, start shuffling around spewing black goo, and are referred to as “vomit zombies” by a character. Now, I realize that that is totally a remark someone would make if confronted by such a thing, but the fact of the matter is, it took me out of the story. And that’s never a good thing. The strange part is, I don’t even know why that phrase and surrounding scene made me roll my eyes and groan. It just felt clichéd and dumb. I guess, to some extent, it felt like the authors were elbowing me in the ribs going “Eh? See how funny we are?” Buuut, maybe that’s just me. Maybe my dislike for the whole “vomit zombie” sequence is just a result of my dislike for zombie fiction in general. (Apologies if you are into zombies. It’s just not my thing.) But oddly enough, I have seen many others bring up the “vomit zombies” in their reviews as well. So it’s not just me. But I still don’t understand why it rubs me (and apparently several others) the wrong way. HOWEVER, the “vomit zombie” sequence is just one scene in a book filled with so many new and exciting ideas. In fact, even the “vomit zombie” element evolves into something much cooler and more interesting in the final chapters. So please don’t take my fretting too seriously; Leviathan Wakes is still an amazingly satisfying, incredibly interesting book. All in all, I thoroughly enjoyed this first installment of The Expanse. James S.A. Corey has created such an intriguing universe filled with fun characters and surprising storylines. I cannot wait to read the next novel, Caliban’s War. Maybe I’ll type up a book review for that one as well, as we wait in anticipation of the upcoming Syfy series. I suppose we’ll cross that bridge when we get to it. Until then! Disclaimer: All videos and images shown belong to Syfy/NBCUniversal and Orbit Books, the use of which have not been specifically authorized by the copyright owner. This blog post is for non-commercial criticism and comment purposes only. I believe that this constitutes a ‘fair use’ of the copyrighted material as provided for in section 107 of the U.S. Copyright Law.